I started typing out the title for this Cat in the Hat Jello post, I thought I was typing the name incorrectly. I am pretty sure I used to think the book was called The Cat and the Hat. In the back of my mind I think I still do. I must have corrected myself somewhere along the way, but I just had this moment of terror where I thought I had been incorrectly titling one of the most popular children's books of all time. As Ruby would say, Ack-weird! Ruby started saying ackweird when she was three honestly that is the most brilliant word that has ever been invented in my opinion. But back to the snacks! The Dr. Seuss cupcakes I posted earlier today, The Lorax Cupcakes and the Thing 1 and Thing 2 cupcakes, are both adorable, but since Dr. Seuss' birthday is tomorrow, you might want something a little easier to throw together last minute. I am the biggest fan EVER of easy to throw together last minute. 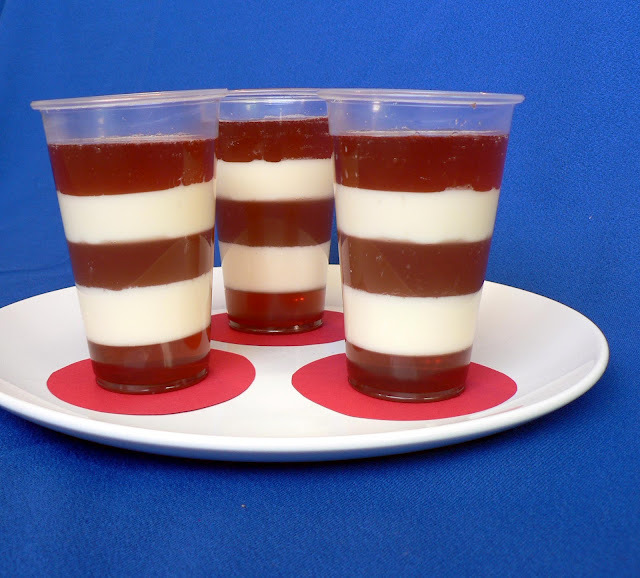 These adorable Cat in the Hat Jello cups fall safely in that category. They still take a little time, since they have to set up in layers, but you can start them tonight and have them ready before school is out tomorrow. You can check out the recipe for these Cat in the Hat treats over at Bless This Mess.